Nokia has just released information about its Nokia 7705 Twist – a phone that looks like no other, based on a concept we mentioned back in April. The main feature of the handset, which will be released in the US this month, is its chassis which seems to twist and turn in a whole manner of ways, eventually ending up as a neat little square to pop in your pocket. 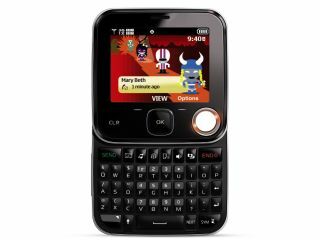 The phone packs in a full QWERTY keyboard, 2.4-inch QVGA screen and also has a 3.0MP camera, complete with autofocus, flash and a self-timer. Targeted at those who like to blog, the Nokia 7705 actually has a neat little 'post to blogs' feature and supports email, IM, MMS and SMS. The phone also allows for video streaming and audio streaming, using two US-based products – Rhapsody and V CAST. You can also customise the handset via its glowing light ring. This essentially means that if you so wish, you can assign a colour to your favourite numbers so when it rings it will glow that colour. There's no word on the Nokia 7705 Twist's UK release date, but it is out on 21 September in the US.